I thought it was going to come already made but it wasnot. Which was ok, it allowed me and my fiance at that time to do things together. Guest completed key tags after they signed into the guest book. Latter each guest read recommendation for keys to successful marriage and place key in a jar bride to be was holding. Q:I would like to order these for our wedding however am wondering if they are personalized as they are in the picture or do you have a writing tool available that can be used to do this. A:The tags are all personalized as shown with "the key to a happy marriage is". A:The keys are approximately 1.5" - 3" in length. They are assorted and will vary by style. Q:Is there only the one beige color of ribbon available for the bronze tag version? A:Yes, that is the only color available. Q:I see blank tags as well as tags that have the text design "Key to a Happy Marriage" - do some tags come blank and some with the design? A:The tags are blank on 1 side, and "The Key to a Happy Marriage is" printed on the other. Q:Do you sell the label pictured on the key separately? A:The tags with ribbons are included with the keys. Q:Is there any way to add an additional 10 keys? I don't need 2 entire lots just a total of 35. A:They are only sold in sets of 24 and cannot be broken up. Q:Does this product come with what is pictured the keys and the tags with ribbon? A:Yes, the contents include 24 keys (6 styles as shown) and 24 tags with ribbon. Q:With what material are the keys made? Metal? Plastic? A:The keys are made from zinc alloy. The key to a successful wedding can be found via these wedding wish key tags. 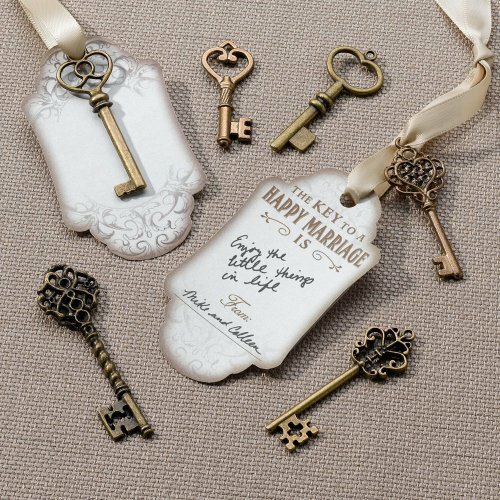 Beautifully antiqued, these key tags look gorgeous once guests fill them in with wedding well wishes and words of advice. Display on a board or collect in an elegant bowl at home as a decorative memento from your big day or give to guest as a favor.